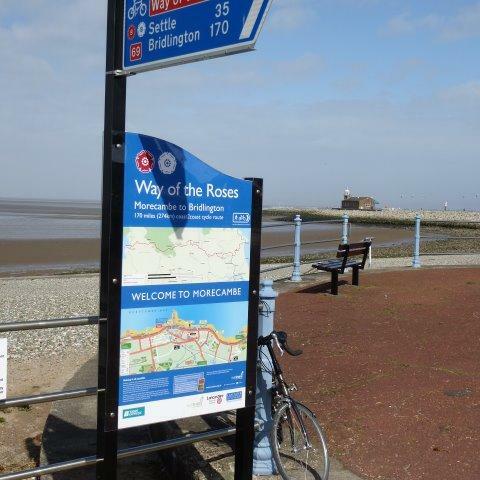 A new 'Welcome to Morecambe' information board now adorns the western end of the route on the promenade just south of the Midland Hotel. Among other things it shows the location of Eric Morecambe's statue, which together with some sunshine and the excellent public art on display should help make you 'happy all the way'! Finally, a visit to Edmondson's Fish Shop on (yes) Yorkshire Street for some Bay caught potted shrimps will surely have you leaving the seaside resort with a smile on your face. Stay at the Westleigh, Berkeley, Balmoral or Trevelyan Guest Houses or, the Crown or Midland Hotel.